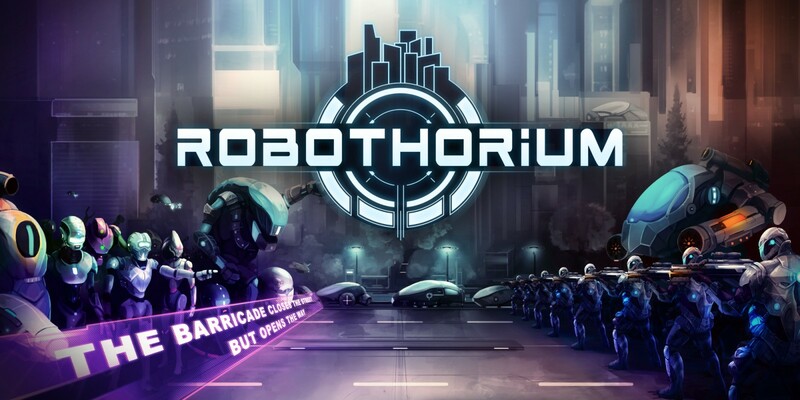 Robothorium is a futuristic, turn-based strategy, role-playing adventure game where you take on the role of the robots that have gained sentience and begin to fight in a war against humans as a means to gaining the same rights as them. As you play through the various stages in the game you begin to add members to your team which you can increase their strength by leveling up, crafting new and stronger weapons, and learning abilities that will help you in the war turning the tide of battle against the humans. During your progression through the world of Robothorium, you begin to uncover the story of the robot/human war and a faction of robots that don’t want to fight the humans, but just want peace and prosperity instead of being the slaves to the humans. Along your journey through the maze-like corridors, you will have opportunities to hack and disarm security systems, kill or set free humans, as well as a call to arms other robots to your cause. Your decisions you make will either set you apart as just another warring group of robots, or give pause to humans you encounter and sway them to your cause. Your actions have an impact, so the game teaches you, though as I played through the campaign, I never really felt that my decisions impacted much of anything in the game. Robothorium has a deep, interconnected labyrinth of menus and upgrade systems in place. The ability to customize your robot army, their weapons and armor, special abilities and more, all come at a cost of either materials you find scattered throughout or dropped after winning battles or by selling off and buying parts you need. The menu system for which you equip and upgrade your robots is complex and not at all easy for the beginner or even the seasoned gamer. I found the system of upgrading my robots tedious as it was slow and load times would often take a bit as the pause menu loaded up. In addition to the tedious system of equipping and upgrading your robot and their abilities, the system in place was not very descriptive as to what additions and modifications you were making and now that affected the gameplay. Each stage of Robothorium has you moving through a system of corridors, navigating up, down, left or right, while moving to an end, sometimes which you could see, but oftentimes halted by enemy encounters or small mini-games of chance where hacking systems or rescuing bots distracted from the overall ending of the stage. When you encountered a mini-game a spinner on the screen would show you a red and green section with either a negative or positive outcome. The percentages varied from 50/50 to 75/25 but the outcome was randomized based on chance. In the case of most of the mini-games the bigger reward was usually the lower percentage of success, but landing those low success rates would net you better gear and outcomes that could help sway battles in your favor. Loot drops that you would find during the game were often random and most items either had one or two robots with which the item could be assigned to. I did feel like early on the starter robots on your team seemed to level up slightly faster and with better equipment than some of the others, though over time that sort of evened itself out. The other part of the stages, enemy encounters, led to 3v3 or up to 6v6 fights where my team of robots was pitted against the bad guys in the game. These human fighters were usually equipped with canine companions, guns of varying level of power, or a robot/human android-like ally. In Robothorium, fights play out in a standard turn-based fashion where you get to choose a move to inflict damage on the enemy; shield, heal or reflect damage to a partner character, or special moves which could inflict damage or modifiers on you or the enemy soldiers. Sometimes, the special moves will cause characters to miss turns, lower their defense or attack power, or allow for attacking multiple enemies at a lower attack power. I played Robothorium mostly as a guessing game, in the beginning, where I selected a move and used it in hopes that it would inflict the most damage and I could just move onto the next character. As I learned what each move did and how it affected the overall outcome of the fight, I learned which moves to use when and which characters to attack at certain times. The main issue that I have with Robothorium is that it never really tells you how to play the game and assumes that you the gamer will learn the ins and outs as you play through and try different moves. Controls in Robothorium are pretty simple with the left control stick operating your characters movement as you navigate the corridors, as well as selecting which move to use and which character to attack or defend during battles. The pause menu also operates your upgrading selection area of the interface, and this is the most cumbersome section of the game. One thing that was confusing at first was having to make the robot selection first before upgrading and the not really intuitive menu system, that I mentioned earlier, which has small text and not a lot of details regarding what items or upgrade paths are best or what exactly they do. During your play through the various stages, you will be told a lot of the story of Robothorium through character speech bubbles that will pop up on the screen. The dialogue isn’t that great and a lot of it was just so wordy and filled with robot war talk about the uprising that it bored me. The lore and world that is being created here, while colorful and deep, was never really intriguing to me as a good narrative. Visually, Robothorium’s design is a bit of a mixed bag too. Movement through the corridors of the stages plays out by pressing up, down, left, right in a linear fashion, with backtracking only necessary if you desire to find 100% of the stages rooms and collectibles. This makes the rogue-lite-ness of the game seem more linear and never really feeling like what you do matters much or changes stage to stage. I often felt like the visual design of the game to be basic and reminded me of flash games of the early 2000’s that I played in browser sites like Newgrounds. The characters that would pop up in the speech bubble portions seemed out of place and not in the same style either, almost as if two different artists worked on the game during the production. Another cheesy area of the game’s visual design is during the fights. The battle animations feel almost stilted with not much interaction between teammates and enemies as you fight or defend your army. The burst of gunfire, electricity, or shields are bland. Some of the iconography in the game was small and unclear as to the ability or mechanic that was overriding and hindering your fighter. I learned was some of the icons meant eventually, but again this was something that the game didn’t really teach you in the early stages. Robothorium has a mixed bag of techno, metallic sounding music playing in the background, and a good variety of battle sounds. Outside of that there isn’t much here and no real in-game dialogue or character voice acting. Overall though, the sounds fit in the game setting, but aren’t anything to brag about. At the end of the day, they get the job done. My two main gripes with Robothorium however, is that it doesn’t teach you, the gamer, well enough the mechanics or why’s of the game. What I mean by that, is that I never knew what decision I needed to make during battles regarding which move to use or what effect it would have on an ally or an enemy. The game didn’t teach me how to play it, or how to best upgrade my robots, and that was frustrating. Early on I won every fight by just making a selection and choosing my moves at random. My other issue comes from the slowness of navigating the menus, from the loading of the equipment screen to the maze of options you’re given, the game almost has too much to do and choose from, but no real reason why is given as far as what options are best for the fights you will encounter. As a new game in a commonly deep genre of game mechanics, Robothorium may be a good game, but on the surface, it’s really hard to recommend this game to the casual turn-based RPG fan. Robothorium has a lot of options and the deep character builds and systems in place are never really explained. I often felt that my decisions meant nothing or had no lasting effects on things. At the same time, I can see that this game had a lot of care put into its design. If you are looking for a lore-filled system of gameplay mechanisms, Robothorium may be right for you. But if you are a casual RPG fan there are other options out there that won’t overwhelm you with systems on top of systems that are hard to understand.